Hit the rocks anytime, day or night, with the 1/0-scale Ready-To-Run Night Crawler. The 1/10 Night Crawler includes a radio system with Spektrum 2.4 GHz DSM Technology, solid front and rear axles with a worm-gear drive, a crawler-specific LiPo compatible ESC and heavy-duty CV Driveshafts. 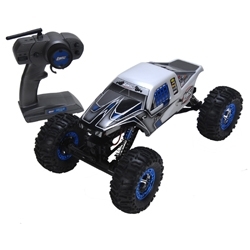 Whether you are new to crawling or an experienced driver, you will have a blast attacking the rocks with the 1/10 Night Crawler.